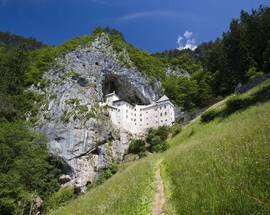 Located some 10km north of Postojna is the Guinness world record holder for the largest 'cave castle' in the world, and the only preserved one of its kind in the world. Predjama Castle (or Predjamski grad, Höhlenburg Lueg and Castel Lueghi in Slovene, German and Italian respectively), was built in a Gothic style by the Patriarch of Aquileia sometime during the 13th century and first mentioned in the historical record in the year 1274. Perched under a natural archway 123m up a sheer cliff face and surrounded by a thick stone wall, throughout the centuries the castle has gained a well-deserved reputation for being virtually impregnable. This fact was most popularly demonstrated during the 15th century by the more than year-long siege of Erazem Lueger, who was a knight and the son of the Imperial governor of Trieste, but had also a gained a reputation as a rather proficient robber baron throughout Habsburg empire. It is said that in 1483, Erazem fled to the castle from Vienna after killing a Marshall of the Imperial Army who had insulted one of his friends, which brought about the wrath of Holy Roman Emperor Frederick II, who laid siege to the castle. 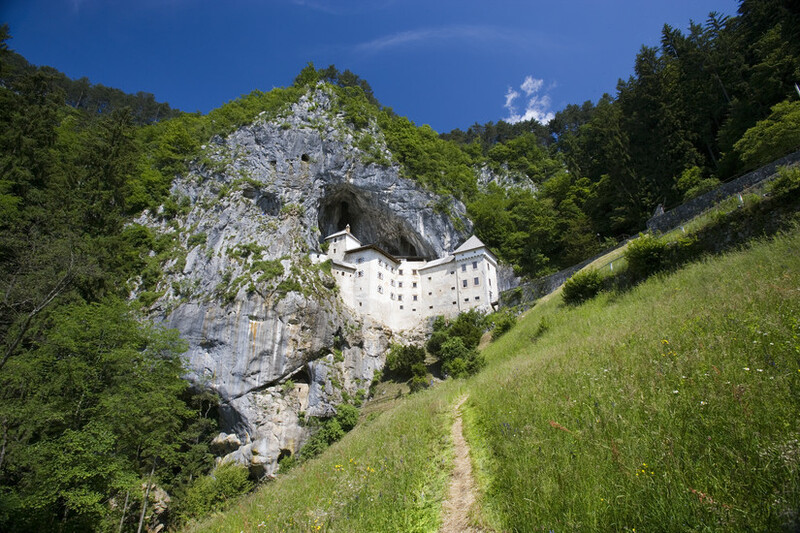 However, thanks to a secret cave leading from the bowels of Predjama to Postojna Cave and then on to the nearby village of Vipava, Erazem was able to secure an steady supply of fresh food and water. Unfortunately for Erazem, his luck ran out when he was betrayed by one of his servants and unceremoniously killed by the shot of a single canon ball while on the toilet. In the years that followed, the castle was destroyed and rebuilt several times, before acquiring a Renaissance style in 1570, which has remained virtually unchanged to this day. Nowadays the castle is open to the public and serves as a museum. It has been completely restored to its original grandeur, and among other sights visitors can see the residential quarters, the chapel and of course the dungeon. It is also possible to see the legendary cave below the castle, although some hiking experience and a minimal level of fitness, especially to scale the narrow 37m Erazem's Passage, is strongly encouraged if not required. During July most summers the castle and its grounds also host one of the region's largest medieval festivals, known as the Erasmus Knight's Tournament, after the castle's most famous occupant. For more information see the official website. Open every day, all year. From Nov to March open from 10:00 to 16:00, in April and Oct from 10:00 to 17:00, in May, June and Sept from 9:00 to 18:00, during July and Aug from 9:00 to 19:00. Admission for the castle € 11.90 for adults, €9.50 for students, €7.10 for children 6-15 years, € 1.00 for children till 5 years; for the cave below the castle €8, €6.40 and €4.80.